Finally, Guo Boxiong, former vice chairman of the Central Military Commission (CMC) and former Politburo member, has been dismissed from the Chinese Communist Party (CCP) and handed over for a court martial. According to Xinhua News Agency, at its meeting on July 30, the Politburo of the CCP reviewed the report on Guo’s case and decided to expel him from the Party and turn his case over to military prosecutors because of his involvement in taking huge bribes, directly and indirectly. Along with Xu Caihou, another former vice chairman of the CMC and Politburo member who was expelled from the Party for corruption, Guo practically controlled the People’s Liberation Army for 13 years on behalf of Jiang Zemin, former president and chairman of the CMC as well as former general secretary of the Party. During his first decade as chairman of the CMC from 1989 to 1999, Jiang did not have any actual power over the military. In September 1999, Jiang began to assert his authority by appointing two of his confidants to the CMC. One was Xu Caihou, the then-executive deputy director of the General Political Department. The other was Guo Boxiong, the then-executive deputy chief of staff of the General Staff Department. Clearly, without the recommendation of Jiang Zemin, these two would have not been promoted to the CMC in their own capacities as deputies. Usually, only chiefs of these general departments are members of the CMC, not their deputies. The only exception before 1999 was Wang Ruilin, who had been Deng Xiaoping’s personal secretary since 1952. He was made a CMC member in September 1995 in his capacity as deputy director of the General Political Department, possibly on behalf of Deng Xiaoping. In the subsequent years, Guo and Xu were promoted to more and more important positions in the military. At the 16th Party Congress in November 2002, Xu was made director of the General Political Department and a member of the Secretariat of the CCP Central Committee. In the meantime, Guo was installed as a Politburo member and the second vice chairman (after Hu Jintao) of the CMC. Two years later, in September 2004, when Hu Jintao finally took over as chairman of the CMC, Guo naturally proceeded to be the first vice chairman and Xu was made the third vice chairman of the CMC (after Cao Gangchuan). Guo and Xu continued to pay their allegiances to Jiang Zemin after he retired as CMC chairman. Xi Jinping’s decision to persecute both Xu and Guo after their retirement reflects his determination to put an end to the dominance of Jiang Zemin (his own patron) over the military. 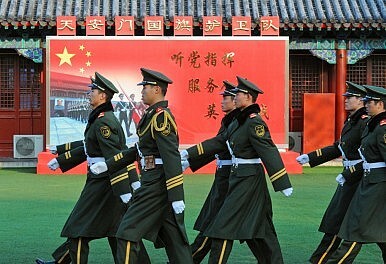 As far as the cleaning up of corruption in the Chinese military is concerned, however, this is just the beginning. As two of the most powerful military leaders in the past 16 years are corrupt, who in the Chinese military is not?